Supercrete is a lightweight Autoclaved Aerated Concrete (AAC) building material which is factory cut into Blocks, Panels and special elements for a wide variety of building applications, both load bearing and non-load bearing. Supercrete offers an impressive range of features and benefits which make it not only economical and pleasing to the eye, but an excellent choice as a sustainable building material . Manufactured from sand, cement, recycled material, lime, gypsum and an aerating agent, it is moulded, cut and steam pressure cured in an Autoclave before being packed, ready for transport. Supercrete AAC is actually hydrated calcium silicate (C5S6H5) known as Tobermorite, which is a naturally occuring crystaline material found around the world. 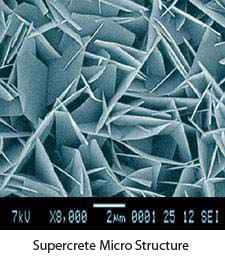 It is this crystaline structure which provides Supercrete with its strength and stability.